Our NJ architectural firm provides a wide range of services, from project feasibility to forensic investigation. Our talents lie in communicating effectively with clients and our team members to ensure quality results in our projects. Architecture, it’s what we do… from schematic design phases through development and three dimensional modeling/rendering. Our job is to help you see what the possibilities are of solving your particular problem, using appropriate media to convey the design intent: sketches, maps, models and more. Can you do what you want, where you want to, for the money you have to spend? We think about the whole picture: from zoning and other permitting, to soils conditions, as well as limitations based on costs and the anticipated challenges of actual construction. More than half our projects involve modifications to existing buildings. We are familiar with historic materials and construction techniques, and can offer and specify newer materials that are compatible with the existing architecture. 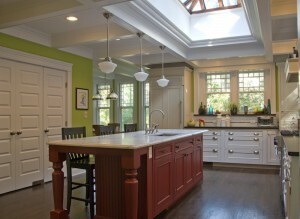 The key in remodeling is to integrate the new with the old to “create flow”. You will throw your money away with a poorly designed renovation. The short term expense of professional input can save money in the long run. Our people are about design and about getting things built (the nuts and bolts). We think about how pieces of the building interact, how they will be installed, and about their durability. We produce clear and coordinated drawings from which contractors can accurately price and build your project. We have completed comprehensive investigations of the condition of many buildings to determine causes of façade failures, roof failures and interior and exterior damages. We are prequalified with the State of NJ as Roofing Consultants and are licensed by the State of California as Building Evaluators under the Safety Assessment Program. As architects responsible for the safety of building occupants, the list of codes and regulations with which we deal is long, and varies by municipality, project type, and individual site conditions. Codes outline the minimum standards for buildings to withstand the forces of their use, as well as loads of earthquakes, floods, and wind events. Changes in materials and technology, environmental and safety concerns, as well as lessons learned (usually through study after the effects of a disaster) perpetuate code updates on a regular cycle. Our office’s continuing education places specific emphasis on staying up-to-date with the ever changing regulations that affect your projects. Having an experienced team makes fit-out work move smoothly and on schedule. We are used to tight design schedules, coordinating with landlord lease terms, and working with furniture and equipment suppliers to complete work to the so you can open your store or office and get back to work. Have a project you’d like to discuss? Please get in touch with us. We look forward to talking with you.